GENERAL DESCRIPTION GENEROUSLY PROPORTIONED + SUBSTANTIAL EXTENDED MATURE Stone Faced SEMI DETACHED RESIDENCE ** FOUR BEDROOMS (THREE DOUBLE) ** SUPERB LONG DISTANCE VIEWS + RURAL OUTLOOK ** SOUGHT AFTER SEMI RURAL RESIDENTIAL CUL DE SAC ** TWO ADJOINING RECEPTION ROOMS ** LARGE LIVING ROOM ** SPACIOUS MODERN LIGHT BEECH SHAKER Style DINING KITCHEN with INTEGRAL APPLIANCES ** MODERN TILED SHOWER ROOM ** GUEST WC ** Gas CENTRAL HEATING with COMBI BOILER ** White uPVC DOUBLE GLAZING ** ATTACHED GARAGE ** DRIVE ** ENCLOSED REAR GARDEN with PATIO TERRACE + LAWN ** CONVENIENT for LOCAL AMENITIES & COMMUTING to LEEDS & BRADFORD. This spacious home will be of particular interest to discerning families, professional couples seeking a well-proportioned, ready to move into accommodation in a pleasant and advantageous location. ENTRANCE PORCH 8′ 8" x 3′ 3" (2.64m x 0.99m) White uPVC double glazed front entrance door with patterned double glazed light. White uPVC double glazed patterned full length side lights. Coat hooks. Space for fridge freezer. Georgian style patterned glazed door to reception hall. RECEPTION HALL 11′ 1" x 4′ 5" (3.38m x 1.35m) Georgian style single glazed entrance door with matching side lights. Built-in understairs storage cupboard. Light neutral decor. Double central heating radiator. Telephone point. Access to first floor staircase, living room, dining kitchen and guest WC. LIVING ROOM 16′ 0" x 10′ 11" (4.88m x 3.33m) White uPVC double glazed window to front. Double central heating radiator. Light neutral decor. Ceiling coving and decorative ceiling rose. Two wall light points. Brushed stainless steel electric pebbled effect fan fire. Sky digital / TV aerial point. Dimmer light switch. Georgian style glazed double french doors to dining room. Panelled door to reception hall. DINING ROOM 11′ 0" x 10′ 6" (3.35m x 3.2m) White uPVC double glazed window to rear with long distance views over field. Central heating radiator. Light decor. Dimmer light switch. Georgian style french doors to living room. Panelled door to dining kitchen. DINING KITCHEN 15′ 6" x 12′ 8" (4.72m x 3.86m) Modern fitted light beech shaker style wall, base and drawer units with cornice and pelmet. Integral fridge freezer. Integral washing machine. Integral automatic dishwasher. Black marbled effect round edged worktops and tiled splash backs. Stainless steel single drainer sink with monobloc mixer tap. Built in four ring gas hob with extractor hood and light over. Built in electric fan assisted oven. White uPVC double glazed window to rear with views over field. White uPVC panelled rear entrance door with double glazed light. Light decor. Spotlights to ceiling. Double central heating radiator. Area for dining table and chairs. GUEST WC 5′ 6" x 4′ 3" (1.68m x 1.3m) White low flush WC with light pine style seat. Coloured inset vanity wash hand basin with chromed mixer tap and pop up waste. Double storage cupboard below. Mirror, shaver point and light over. Extractor unit. Tiled splashbacks with feature tiles. Light decor. Panelled door to reception hall. STAIRCASE AND LANDING 9′ 9" x 9′ 0" (2.97m x 2.74m) max Painted decorative metal spindles to return staircase. L shaped landing. White uPVC double glazed patterned window to side. Access to four bedrooms and shower room. Access to boarded loft with two velux windows to rear and drop down pine style ladder. Potential for further development (subject to necessary building regulation / planning approval). 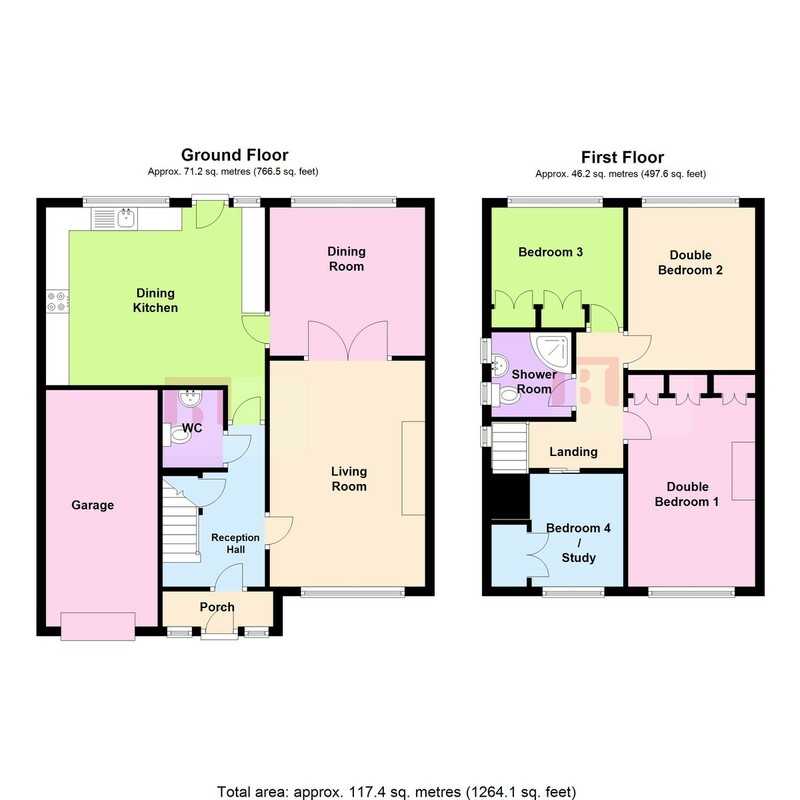 DOUBLE BEDROOM 1 15′ 0" x 9′ 0" (4.57m x 2.74m) White uPVC double glazed window to front. Central heating radiator. Three double fitted wardrobes with cupboards over. Light neutral and accent decor. Ceiling coving. Panelled door to landing. DOUBLE BEDROOM 2 11′ 6" x 9′ 0" (3.51m x 2.74m) White uPVC double glazed window to rear with long distance view. Central heating radiator. Space for bedroom furniture. Light floral decor. Ceiling coving. Panelled door to landing. DOUBLE BEDROOM 3 9′ 0" x 8′ 6" (2.74m x 2.59m) A small double or large single bedroom with long distance view over fields. Central heating radiator. Two double fitted robes with hanging and shelving. Light neutral decor. Ceiling coving. Panelled door to landing. BEDROOM 4 / STUDY 8′ 0" x 5′ 8" (2.44m x 1.73m) Presently used as a study. White uPVC double glazed window to front. Central heating radiator. Over stairs built-in linen storage cupboard with shelving. Sliding panelled door to landing. SHOWER ROOM 6′ 4" x 5′ 4" (1.93m x 1.63m) Modern white three piece suite comprising: Corner glazed shower cubicle with electric shower, grab rail and fold away disabled seat. Inset vanity wash hand basin with chromed monobloc mixer tap and white gloss cupboards and drawers below. Close coupled WC with matching white seat and tiled boxed pipework. Chromed central heated towel rail. Ceramic tiling to walls. Two white uPVC double glazed patterned windows to side. Stone tiled effect vinyl flooring. Stainless steel spotlights to ceiling. White panelled door to landing. EXTERIOR REAR Enclosed rear garden with lawn. Mature shrubbery. Wood lap fencing. Views over field. Crazy paved patio area. Flagged path. Bin storage area. Concrete step to rear entrance door. GARAGE 15′ 9" x 8′ 3" (4.8m x 2.51m) Attached single mono pitched roof garage with metal ribbed up and over door. Power and light, Wall mounted gas combi instant hot water boiler. Fitted wall cupboards. Meters. Mahogany effect uPVC facias. Security light. EXTERIOR FRONT Concrete path to side leading to rear garden. Screening conifer hedge. Concrete drive for one vehicle. Lawn with mature flowering cherry tree. Raised shrubbery borders. Stone boundary wall. Raised flower beds. Flagged path. Flagged patio terrace. White uPVC soffits. White uPVC double glazed front entrance door with patterned double glazed light. White uPVC double glazed patterned full length side lights. Coat hooks. Space for fridge freezer. Georgian style patterned glazed door to reception hall. Georgian style single glazed entrance door with matching side lights. Built-in understairs storage cupboard. Light neutral decor. Double central heating radiator. Telephone point. Access to first floor staircase, living room, dining kitchen and guest WC. White uPVC double glazed window to front. Double central heating radiator. Light neutral decor. Ceiling coving and decorative ceiling rose. Two wall light points. Brushed stainless steel electric pebbled effect fan fire. Sky digital / TV aerial point. Dimmer light switch. Georgian style glazed double french doors to dining room. Panelled door to reception hall. White uPVC double glazed window to rear with long distance views over field. Central heating radiator. Light decor. Dimmer light switch. Georgian style french doors to living room. Panelled door to dining kitchen. Modern fitted light beech shaker style wall, base and drawer units with cornice and pelmet. Integral fridge freezer. Integral washing machine. Integral automatic dishwasher. Black marbled effect round edged worktops and tiled splash backs. Stainless steel single drainer sink with monobloc mixer tap. Built in four ring gas hob with extractor hood and light over. Built in electric fan assisted oven. White uPVC double glazed window to rear with views over field. White uPVC panelled rear entrance door with double glazed light. Light decor. Spotlights to ceiling. Double central heating radiator. Area for dining table and chairs. White low flush WC with light pine style seat. Coloured inset vanity wash hand basin with chromed mixer tap and pop up waste. Double storage cupboard below. Mirror, shaver point and light over. Extractor unit. Tiled splashbacks with feature tiles. Light decor. Panelled door to reception hall. Painted decorative metal spindles to return staircase. L shaped landing. White uPVC double glazed patterned window to side. Access to four bedrooms and shower room. Access to boarded loft with two velux windows to rear and drop down pine style ladder. Potential for further development (subject to necessary building regulation / planning approval). White uPVC double glazed window to front. Central heating radiator. Three double fitted wardrobes with cupboards over. Light neutral and accent decor. Ceiling coving. Panelled door to landing. White uPVC double glazed window to rear with long distance view. Central heating radiator. Space for bedroom furniture. Light floral decor. Ceiling coving. Panelled door to landing. A small double or large single bedroom with long distance view over fields. Central heating radiator. Two double fitted robes with hanging and shelving. Light neutral decor. Ceiling coving. Panelled door to landing. Presently used as a study. White uPVC double glazed window to front. Central heating radiator. Over stairs built-in linen storage cupboard with shelving. Sliding panelled door to landing. Modern white three piece suite comprising: Corner glazed shower cubicle with electric shower, grab rail and fold away disabled seat. Inset vanity wash hand basin with chromed monobloc mixer tap and white gloss cupboards and drawers below. Close coupled WC with matching white seat and tiled boxed pipework. Chromed central heated towel rail. Ceramic tiling to walls. Two white uPVC double glazed patterned windows to side. Stone tiled effect vinyl flooring. Stainless steel spotlights to ceiling. White panelled door to landing. Attached single mono pitched roof garage with metal ribbed up and over door. Power and light, Wall mounted gas combi instant hot water boiler. Fitted wall cupboards. Meters. Mahogany effect uPVC facias. Security light.